We use only organic and natural wild-crafted herbs in the Liver Cleanse Concentrate so you get a high-quality, potent and effective herbal remedy you'll enjoy using. The herbs in Liver Cleanse Concentrate such as milk thistle seed, dandelion and chanca piedra support liver health and encourage a natural flush of your liver and gallbladder. This tincture also includes herbs that aid healthy digestion like garlic, ginger and fennel. The liver is the primary filtering and detoxifying organ of your body. It was designed to protect you 24/7. Nowadays, your liver needs to filter out more toxins than ever before. 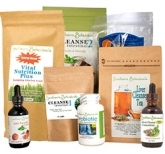 Every day you are exposed to toxins from processed foods, additives, air pollution, a contaminated water supply, drug residues, personal care and house cleaning products. Flushing your liver out two or three times a year or more relieves the liver of these toxins, making it easier for it to maintain healthy functioning. Our formula has been updated to remove wormwood, a strong bitter herb which should not be used continuously long term. We have this herb available in our Anti-Parasite Concentrate to give potent parasite killing destructive power when you need it for liver, gallbladder and intestines. Instead our updated formula contains Chanca Piedra, an amazing herb from the Amazon, which is extremely protective of liver cells, and aids the liver in detoxification. Its name means "break stones". We think you will be pleased. Now our Liver Cleanse Concentrate can be taken safely by people who prefer a milder supportive cleanse over a longer period of time. A perfect complement to our popular Liver Cleanse Tea! 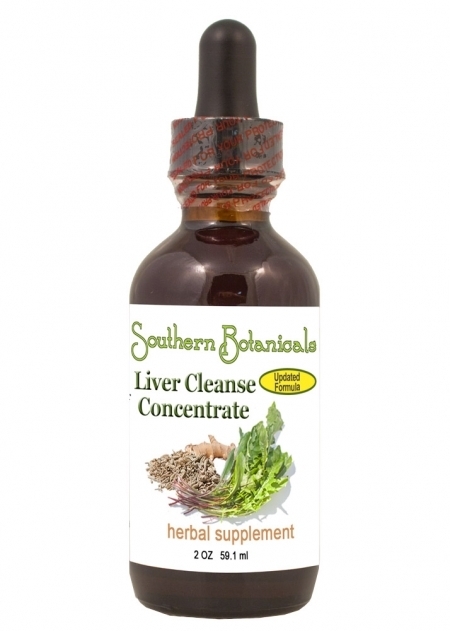 For those who liked it, our original Liver Cleanse formula is still available. 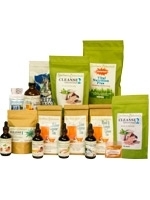 Just choose Liver Cleanse Concentrate, Original Formula above when you shop. We recommend you take Intestinal Cleanse 2 while using the original formula to absorb the strong bile flush produced by the wormwood in it. We recommend not using the Anti-Parasite formula at the same time because we do not want you to overdo the wormwood which is in both formulas. You can use the original formula with Liver Cleanse Tea. If you wish to attack parasites while you cleanse the liver and gallbladder, you can use the Anti-Parasite and updated Liver Cleanse formula together and get the benefits of both. Ingredients (*Organic, +Wildcrafted): Milk Thistle seed*, Oregon Grape root+, Gentian root*, Chanca Piedra leaf+, Garlic bulb*, Fennel seed*, Dandelion root* and Ginger root* in a base of distilled water and certified organic GMO-free alcohol. Updated Formula. Milk Thistle Seed is a powerful liver detoxifier and tonic. It stimulates bile production to help break down fats and improve digestion. Milk thistle's strong antioxidant activity supports liver cell regeneration. Oregon Grape Root It increases blood flow to the liver and stimulates bile production, and has antimicrobial preoperties. Gentian Root stimulates and tones the entire digestive system. It is well-known as a liver tonic and a remedy for digestive issues such as flatulence, indigestion, and upset stomach. Gentian Root boosts the liver's ability to break down and assimilate fats and proteins. This gives you more energy, helping to restore physical and mental alertness. Chanca Piedra protects liver cells while supporting the liver's natural detoxification function. Anti-flammatory. Its name translates as "stone breaker". Dandelion Root is diuretic and detoxify the liver and gall bladder by flushing out wastes. Their antioxidants cellular renewal in the liver. Ginger Root aids in reducing gastrointestinal problems such as bloating, heartburn, flatulence, indigestion and stomach cramps. Its antioxidants relieve oxidative stress caused by free radicals and help to repair liver damage. It has a calming anti-inflammatory effect on the entire body. Ginger also promotes metabolism of fats. Garlic is anti bacterial, anti-parasitic and antiviral. It kills many types of parasites. It also improves digestion. Fennel Seed is an antioxidant supporting cellular health. The fiber in fennel seed binds itself to bile salts and prevents excess fats from being absorbed back into your body. It also handles gas. Note: This formula is even more effective when used in conjunction with the Liver Cleanse Tea and the Liver Cleanse Program. If you have a recurrent or serious liver condition see your doctor. Not for use by pregnant or nursing women or children.